Author note: Linda Bigelow is a photographer and hiker who lives in St. Jeannet, a medieval hill village on France’s Cote d’Azur. Here follows is a photo-essay of a hike she and a group of friends undertook earlier this summer. The route, described here, is designed for experienced hikers. It begins and ends in a bend in the road above the village of Allos. Photo credits: Linda Bigelow, July 2008. Captions at bottom of post. 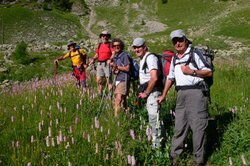 In July, my friend Marie-Claude and I joined Alain, our guide, and three other hikers - Michel, Claude, and Raymond - for a “reconnaissance” of Valplane, an area tucked between the town of Allos and the “Lac d’Allos” in the Southern French Alps, north of Saint Tropez. Our goal was to explore a mostly off-trail circuit that followed a series of three crests, to determine if the route would be viable for Alain to use with experienced hikers later this summer. None of us had ever made this hike before, so it was to be à l’aventure. Marie Claude picked me up in our village parking lot at 5:45 am. We drove to Saint Andre les Alpes where we met the others at 7:15 am. From there we drove to a tiny parking space in the bend of a road above the town of Allos. We started hiking around 8:30 am. The first part of the itinerary took us through a pine forest, past a beautiful waterfall, to the first crest, the Crest des Graus, via a series of grassy slopes and then on to its summit. Just after entering the forest, we came across a patch of elegant, burgundy-colored lis Martagon. Further on, we found ourselves in a scruffy ravine from which we had to scramble up to the trail above. 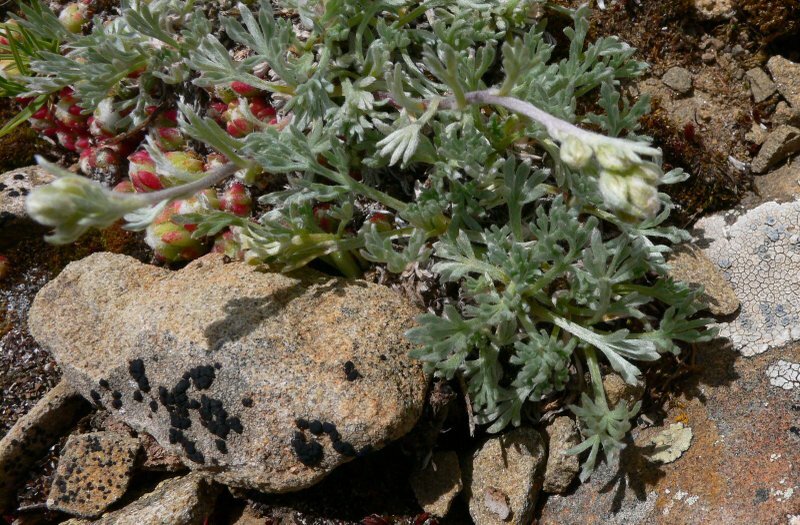 Soon the trail broke out into the sunshine where we were greeted by carpets of colorful wildflowers. Here we left the trail and moved up to the Crest des Graus – following a zigzag trajectory. Along the crest’s side, we came to a large rocky rise which Alain and Marie-Claude decided to hike over to the other side. The rest of us chose the “easier” route via the flank. We agreed that we would meet our two more adventurous colleagues at the point where they planned to descend - farther along the crest. The four of us arrived uneventfully at the agreed-upon meeting point, but Marie-Claude and our guide were nowhere to be seen. Finally, we saw Marie-Claude struggling down through the rocks without having crested the summit and Alain appearing from the opposite side. A trek over this particular rocky rise was, therefore, struck from the itinerary for the future hike. 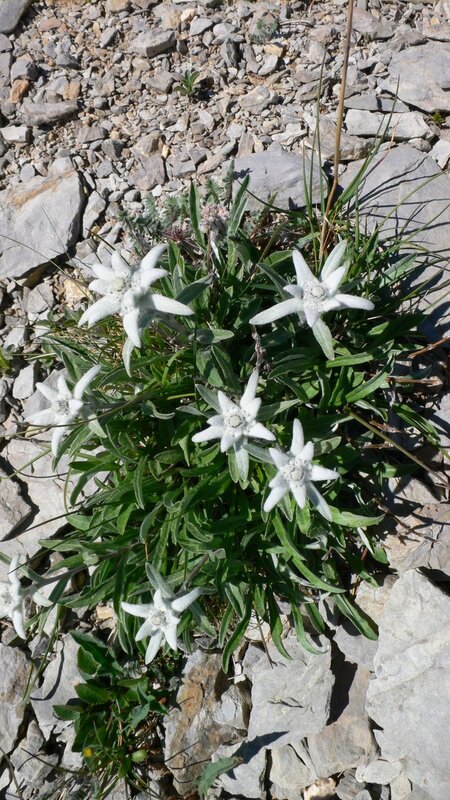 We next came across a patch of beautiful Edelweiss and a few blue Alpine asters. From there we hiked along a steep incline up to the Graus itself with its spectacular views of the Montagne de la Jassine. When driving through the valley below, the Montagne de la Jassine appears to have rabbit ears very much like those on cartoon caricatures of George W. Bush, but high up on the Graus both the rabbit ears and President Bush happily disappeared. 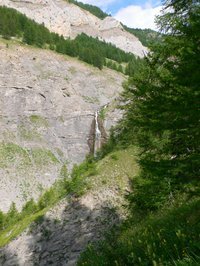 The second part of the hike followed the Crest de Valpane, the second of our route’s three crests, to the Tête de Valplane. This crest was at a 45 degree angle from the first one. Not far along the crest, Raymond stopped to announce that he smelled “Genepi.” Genepi is a tiny, low-lying plant that grows among the rocks of the high Alps and its flowers are treasured as the major ingredient of Genepi spirits that are found frequently in little flasks buried in the backpacks of hikers. 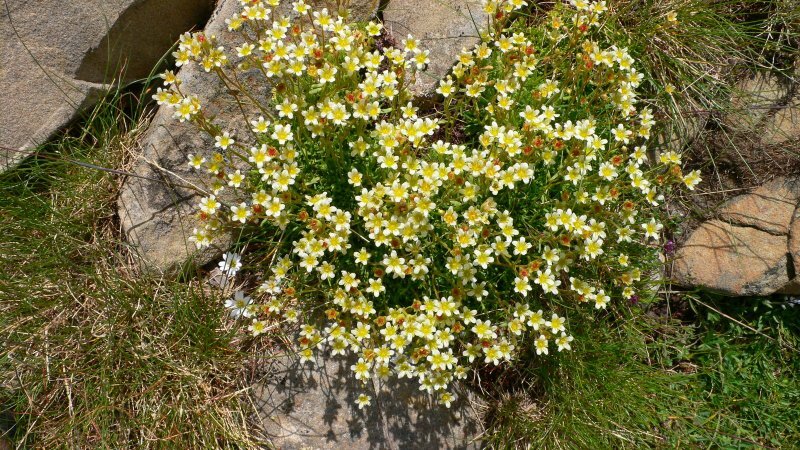 Without its strong distinctive odor, the plant would go completely unnoticed. Although I have drunk the powerful spirit as a digestive at the end of a hiking picnic, this was my first acquaintance with the plant itself. Not much further on as we neared the crest’s lowest point, Claude developed leg cramps and could continue no longer. We stopped to eat the lunches we had brought with us hoping this would also give him time to recover. A round of Genepi was also greatly appreciated, but, unfortunately, neither time nor Genepi relieved our fellow hiker’s cramps. Raymond stayed with him while the remaining four of us continued along the crest towards the Tête de Valplane. There was a vague trail that skirted an unfriendly, rocky rise along the crest. Making our way along this steep flank was tricky because the “trail” had washed out in places leaving us only with rolling, gravelly sorts of stones to walk on. Finally, we started up the Tête de Valpane itself, which turned out to be an easy grassy climb. What a spectacular sight awaited us! Below was the beautiful, blue-green Lac d’Allos with green slopes and formidable rock towers encircling it. We spent time near the sturdy, summit cairn – taking photos of ourselves and the broad vistas beyond. The hike’s final leg presented a toss-up. 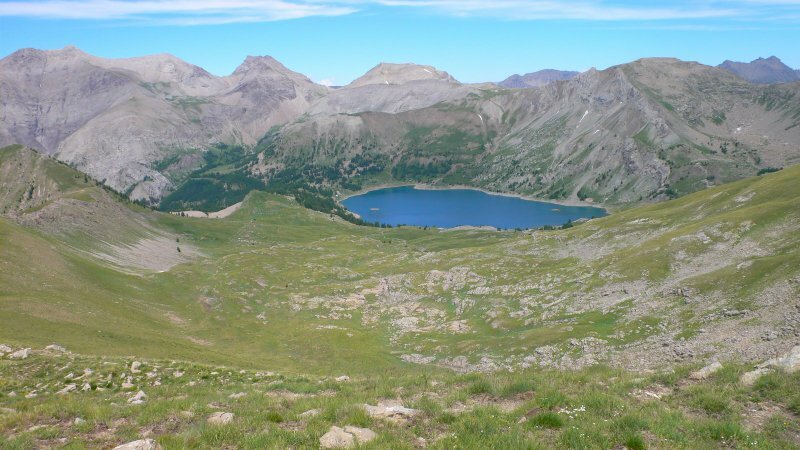 We could either make our way down to the lake via a series of grassy slopes and then hike along a road back to our car or we could follow the third and final crest, the Crest de Monier, back to the starting point. We chose the latter, but despite our good topographical maps, there remained a difficult area in question. Could we get through its crags or not? This decision was taken out of our hands, however, because of the necessity to return to the two hikers presumably awaiting us along the route from which we had come. We turned back but when we reached the place where we had left them, they were nowhere to be seen. At this point, we could only continue to retrace our steps of the morning and hope to meet them back at the car. We did not in the end, however, have to retrace our steps completely. Instead, we dropped over the side of the Crest de Graus and followed a trajectory that took us through a profusion of wildflowers along one side of a triangle eventually meeting up with the small trail that we knew would lead us back to the route’s beginning. We passed our now familiar waterfall, waded through a clearing filled with flowers, and struck out once again through the trees and back down to the car. Our two missing hikers were there waiting. Claude had recovered enough to walk unaided so the pair had made their way slowly back down unbeknownst to us. 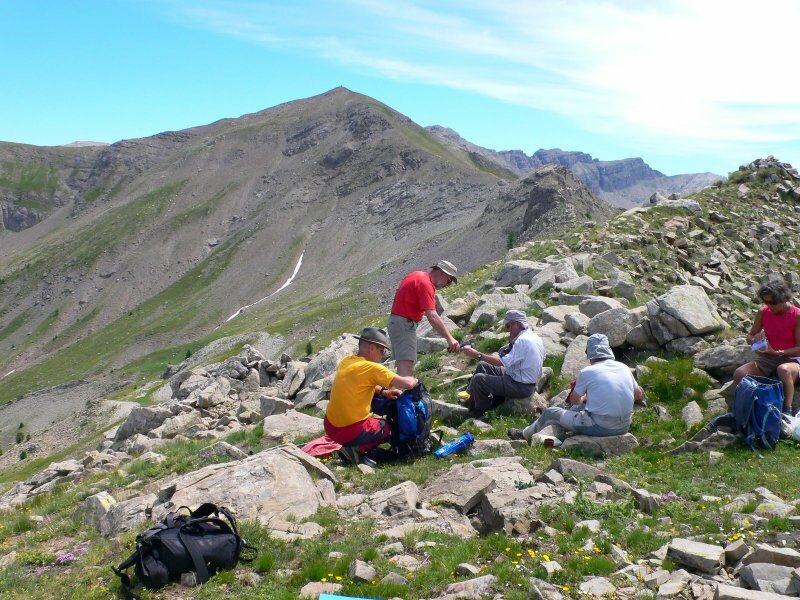 There had been – suffice it to say in hindsight – way too much miscommunication about the two groups’ plans plus far too much reliance on cell phones - notoriously fickle in the mountains. At the end of the day, we had hiked for eight hours and covered a cumulative ascent of 1,200 meters. Tired and thirsty, we stopped by Claude’s for cold drinks and some of the carrot cake I had baked - before Marie-Claude and I tiredly made our way, by car, back home. 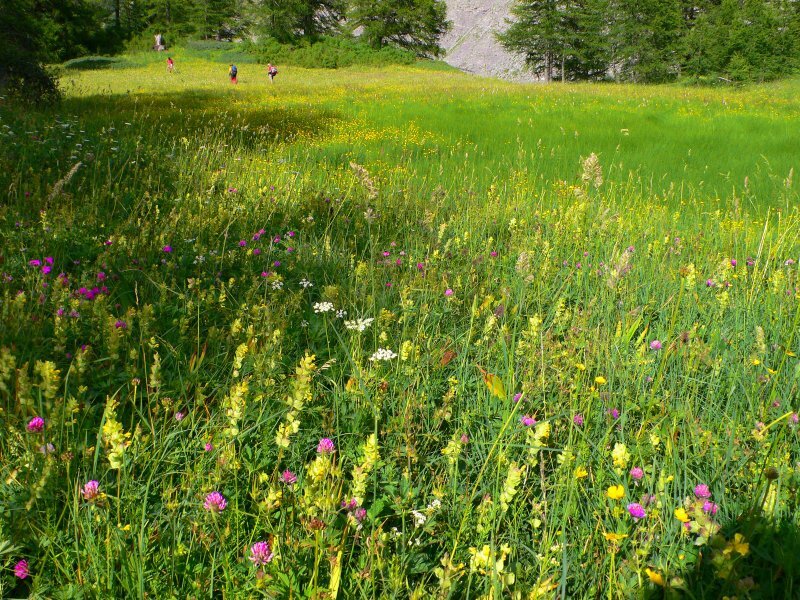 Photo credits: Linda Bigelow; Photo captions (top to bottom) 1) The "reconnaisance team" - left to right - Alain (guide), Michel, Marie-Claude, Claude, Raymond; 2) On the Crest de Graus; 3) Field of wild flowers, Valplane; 4) Edelweiss; 5) Genepi plant. The red berries belong to a different plant; 6) Picnic lunch on Valplane; 7) Lac d'Allos; 8) Alpine flowers; 9) Valplane waterfall in full sun.